When people ask me what we do at Crowd Favorite, I tell them “we build cool stuff on the web”. 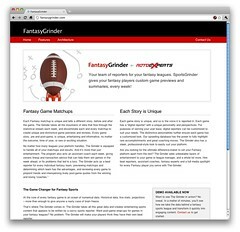 One of the latest examples of this is FantasyGrinder: an application and web service that creates fun, meaningful game recaps from weekly fantasy sports matchups. The system is pretty sophisticated. It’s a web application that allows editorial definition of complex rules and associated clauses with powerful data token replacement/insertion and it’s a series of web services that work together to manage and process a ton of data in parallel and produce some pretty awesome results. FantasyGrinder looks for great individual efforts, compares starters to bench players, actual player performance to projected performance, comparisons between multiple players, etc. – the rule engine is very powerful. As someone who has played fantasy sports for the last decade, it was a real treat to work with the excellent folks at RotoExperts to help bring FantasyGrinder from concept to reality. We have a more detailed case study in our portfolio.